UW encourages undergraduate research across disciplines to increase learning as well as improve graduate school and career prospects. From genotyping mice to sampling isotope data from streams to studying ADHD in adults, University of Wyoming students across campus participate in exciting undergraduate research projects. These projects offer numerous benefits to students. Through hands-on learning, students better understand course material, concepts and research done by others. They also gain valuable skills and resume boosters for graduate school and career. In addition, students conducting undergraduate research benefit from mentors as they work side by side with graduate students and professors. UW encourages undergraduate research opportunities through a number of programs across colleges. These programs provide funding and opportunities for students to share the results of their work. Below you’ll meet seven undergraduates undertaking a variety of research pursuits. Karly Higgins discovered a love for research at UW and now plans to pursue her Ph.D.
Higgins has worked on a number of research projects, all funded through various programs at UW. She began as a lab tech when animal science Assistant Professor Wei Guo invited her to genotype mice in his lab, and she presented the results at Wyoming Undergraduate Research Day in 2015. She then moved on to a histological analysis on mice skeletal tissue and presented those results at the annual Wyoming INBRE (IDeA Networks for Biomedical Research Excellence) conference. Hungry for more, she began research on the isolation of the protein titin, also known as connectin, which is responsible for the elasticity of muscle in humans. “At this point, I knew I had a burning desire to continue my career as a researcher into graduate school, and so I joined the McNair Scholars Program, which provided summer funding for this project,” Higgins says, adding that she then presented the results at the McNair Symposium at University of California–Berkeley. Higgins is now working in botany Professor Katie Wagner’s lab on research centered on hybridization patterns in Wyoming trout. 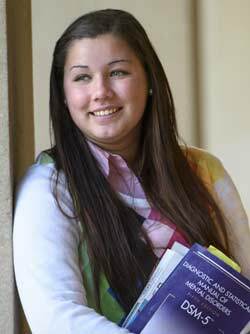 She will graduate in May 2017 and plans to pursue a Ph.D. in marine science. Phil Klebba of Sheridan, Wyo., created a uniquely Wyoming college experience—one that included studying isotope data in the lab and working summers for the Wyoming Conservation Corps, where he tagged bats at Devils Tower and tested prairie dogs for black-footed ferret reintroduction. “With the conservation corps, I got to see some awesome things like a herd of elk running through mist and a group of jackrabbits bouncing through a field—lots of amazing experiences,” Klebba says of his time outdoors. Undergraduate researchers learn that real-world problems are not as straightforward as classroom problems. “It’s interesting because class problems are always set up with a pretty clean answer, and then you get out there, and it’s messy,” says Klebba, who was awarded the Trustees’ Scholars Award when he came to UW. Darbi Schlenker believes her undergraduate research experience will help give her a leg up for medical school. 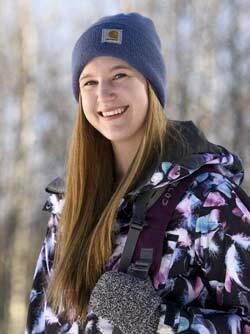 Growing up in Meeteetse, Wyo., Darbi Schlenker participated in the Wyoming State Science Fair and represented Wyoming twice at the International Science and Engineering Fair. As a senior in high school, she took home first place in the Wyoming State Science Fair senior Engineering Design and Innovation division, receiving a special first-time award from the Wyoming Research Scholars Program. Part of UW’s Science Initiative, the Wyoming Research Scholars Program pairs undergraduate students with faculty mentors to participate in cutting-edge funded research as early as their first year. She also received the UW Trustees’ Scholars Award. Schlenker’s ultimate goal is to become a doctor, and she believes the Wyoming Research Scholars Program will give her valuable new skills and opportunities. She finds Laramie the perfect location for a college town. “The surrounding area of Laramie is beautiful and offers cool outdoor activities I have really enjoyed over the past semester,” Schlenker says. “Also, I like that more urban areas are only a short drive away. Anna Garner worked in two different labs at UW and presented her work at a national conference in New York City. Conducting research in UW’s psychology labs is giving Anna Garner of Afton, Wyo., the experience she needs to pursue her Ph.D. in psychology. At the Attention and Learning Laboratory, Garner helps study ADHD in emerging adults, while at the Social Cognition Laboratory, they’re studying implicit association (unconscious bias) in juries. Garner presented a poster of her research at the annual convention of the Association for Behavioral and Cognitive Therapies in New York. Garner also finds time for other involvement at UW, including the National Society of Collegiate Scholars, Mortar Board senior honors organization, Psi Chi International Honor Society in Psychology, Psychology Club and being a member of the student affairs student advisory board. An Engineering Undergraduate Research Scholar, Finley McIlwaine conducts research into advanced combustion technologies as part of the Belmont Energy Research Group. As part of the Tier-1 Engineering Initiative, a number of top high school graduates are offered funded and mentored research as part of the Engineering Undergraduate Research Scholars Program. 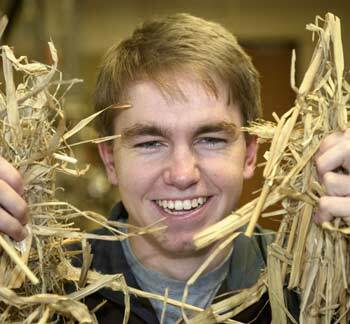 Finley McIlwaine of Cheyenne, Wyo., is one of the current scholars and had his choice of labs to work in. He chose to be a part of mechanical engineering Assistant Professor Erica Belmont’s Belmont Energy Research Group. “We do research into advanced combustion technologies and flame analysis,” McIlwaine says. For example, one of the projects he’s working on investigates energy alternatives for villages in Haiti. McIlwaine also finds that the faculty members go out of their way to help students. “The professors are unreal in their willingness to help students,” he says. To balance out his heavy academic load, McIlwaine plays intramural sports including basketball and soccer. “I try to get out to Happy Jack Recreational Area and Curt Gowdy State Park as often as I can,” he adds. “I like to hike, mountain bike and snowboard—basically anything that gets me outside being active. “Another thing I like about UW and Laramie is the people and the environment—everybody is so friendly, and the small-town vibe really adds a sense of community to the university,” he says. 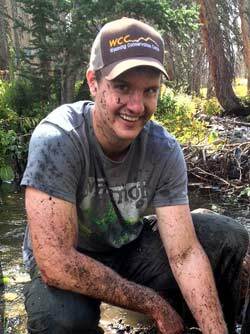 Cameron Sloan of Cheyenne, Wyo., plans to put his undergraduate research skills to use in the environmental science field. “I feel that my research will help to show employers that I am able to balance a busy schedule and that I have the ability to effectively communicate, work in a team as well as work independently, and work with a variety of different audiences,” Sloan said just after graduation. After his first summer of research, Sloan presented his findings at GIS in the Rockies and the Western Planner Conference in 2015. He continued undergraduate research and presented a poster and presentation at the Wyoming Undergraduate Research Day in 2016. Sloan also participated in the School of Energy Resources club, the Restoration Outreach and Restoration club, the Order of Omega Greek leadership honor society and intramural sports. 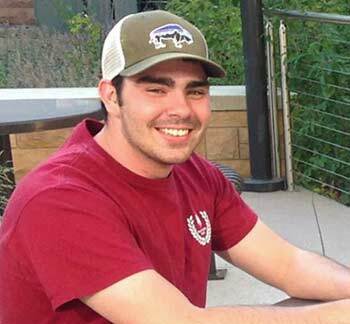 He cites his fraternity, Sigma Phi Epsilon, as one of his most meaningful college experiences. When not conducting research, Hannah Jernigan enjoys hiking, snowboarding, kayaking and snowshoeing in the nearby mountains. 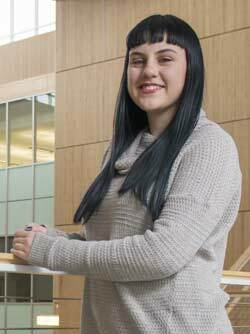 Hannah Jernigan of Cheyenne, Wyo., began undergraduate research at Sheridan College and has found continued success at UW. “My end goal is to be a research biologist, so any type of research I can get my hands on and opportunities I can take advantage of help me out tremendously,” she says. Jernigan began her research as a Wyoming INBRE (IDeA Networks for Biomedical Research Excellence) intern in the summer of 2014. As part of the National Science Foundation Community College Innovation Challenge, she worked on a project optimizing the genetic engineering of algae for biofuel. The project took her all the way to Washington, D.C., where she presented it on Capitol Hill. Transferring to UW, Jernigan received INBRE’s Transition Fellowship and did a rotation through several different labs. In the summer of 2016, she presented at the Society for In Vitro Biology’s international conference in San Diego, which she describes as a wonderful experience.